It is important that you read carefully before signing any document for performing of service, especially when it may involve turning over your rights to someone else. If your home has roof damage, your first thought may be to call a contractor to repair it before contacting your insurance company. This can be a costly mistake. Before signing any form of document that includes assignment of benefit material, it is important to read carefully. 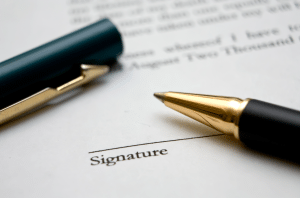 We strongly recommend speaking with your insurance agent before signing any such document. There has been an increase in the last year of homeowners who have unknowingly signed contracts that include assignment of benefit agreements in them. These forms are provided by contractors and must be read carefully. By signing this agreement, you may be allowing the contractor to collect your claim settlement money directly from your insurance company. The end result is homeowners losing control of the insurance claims process and in unfortunate incidents, could mean paying beyond what is covered in the policy. By signing this agreement, you may be signing away control. We strongly recommend calling your insurance agent before signing any document that includes assignment of benefits wording.